It’s baaaaccckkkk!! 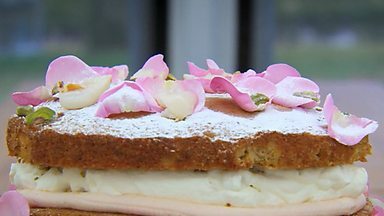 The Great British Bake Off returned to our screens on Tuesday with it’s first episode all about cake. This series we have 13 bakers, whittled down from over 10,000 applicants. I bet the judges gained a lot of weight during the decision process! The first challenge was to make a sandwich cake. Easy enough you might think, but as Paul points out, if they mess it up, it will be plain to see. Most of the bakers went for fruity flavours like grapefruit (Becca), lemon (Mark), pineapple (Deborah) and blood orange (Kimberley). actually made her cake into the shape of a sandwich and created a ‘paper’ bag for it. I’m excited to see what both of these two come up with in the future! It’s painful to see how easily the bakers crumble under the pressure of the cameras, time deadlines and prospect of Mary & Paul tasting their bakes. Things they have made or done many times before suddenly go wrong. Ruby’s cream patisserie curdled, Mark didn’t pre-heat the oven, Howard’s cake wasn’t cool before he applied the buttercream, and Christine didn’t have enough time to complete her basket piping work. 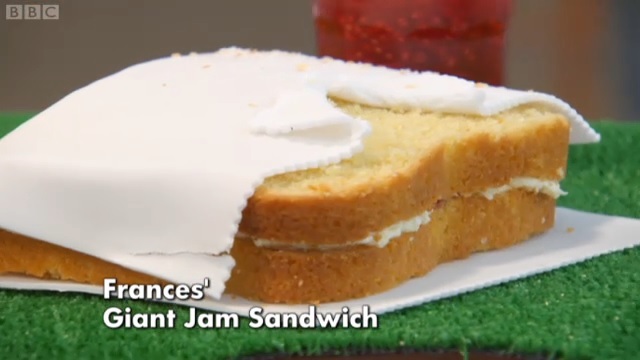 It’s amazing how this show can make a simple sandwich cake look like an absolute nightmare to make! Most of the bakers got good results from the judges. Paul loved Ali, Becca and Howard’s cakes. Rob who made a pecan and apple cake, Toby who made a carrot cake, and Lucy also got good comments. Mark, Ruby and Christine were not so lucky. And Frances fab jam sandwich cake lost points for the jam filling tasting too strongly of rose, but the judges agreed it was a very fun and creative idea. The technical challenge was Angel Food Cake (which I have made this week!) with a lemon and passion fruit curd topping. This sponge cake originates from the USA, and is made with egg whites and no butter. It is called angel cake because it is so light and airy. There was huge debate between the bakers over whether to grease the tin or not. Rob was one of the only ones who didn’t and his cake came out beautifully (pictured above). Poor Toby did a ‘John’ and lined his tin with salt by mistake! From the results the bakers got, lining the tin is definitely a bad idea. Ruby, Toby and Ali were in the bottom three, Christine came third, with Lucy second, and a very modest Rob won the challenge. The third and final challenge was a chocolate cake, that had to be decorated with at least two types of chocolate. Lucy again braved it with flavour for a thyme cake decorated with figs and chocolate trees. Ali, Rob and Kimberley all used raspberry. Most of the baker made tiered cakes, with Glenn stacking up an epic seven tier’s for his almond and espresso cake! Decorating the chocolate cakes involved tempering chocolate, which is melting it to a specific temperature before shaping it. Rob really impressed me with the stripey chocolate cigars he made. Frances did a nod to the GBBO squirrel and the hidden image cakes of last series first episode with her fantastic squirrel cake. 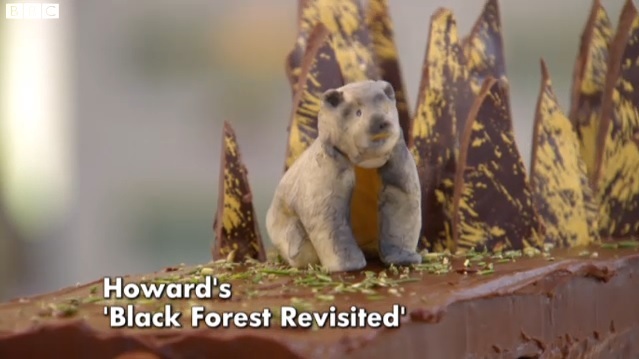 And Howard modelled a silver bear from modelling chocolate for the top of his cake, based on Mr. Hollywood I think! 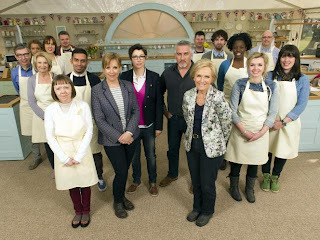 It was clear that nerves got to the bakers, with almost all of them covered in blue plasters by the end of the episode. I expect that this affected a lot of their skills, and they did things they wouldn’t normally do. 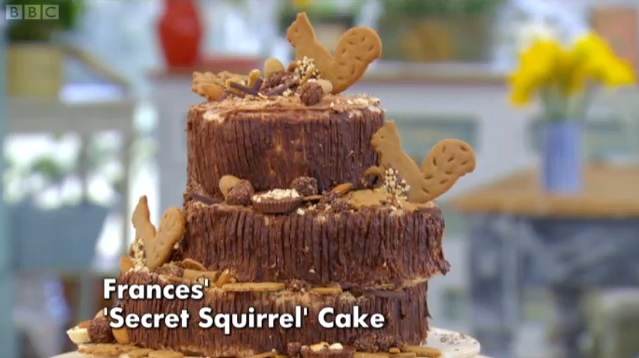 To make it this far to the live shows they have already proved their baking prowess. Rob won star baker this week, which I think was well deserved as he got glowing results throughout. 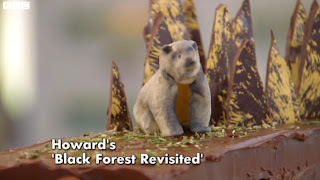 Sadly Toby (pictured above) was the first to go, although his first bake was liked by the judges, he came last in the technical challenge and his final showstopper was, as Paul said, “a mess”. Next week – bread! 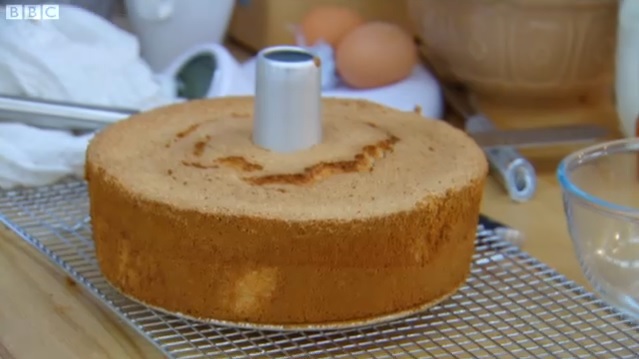 I decided to make an Angel Food Cake for my first GBBO challenge. This cake is fat free because of the lack of butter, so of course I smothered it in chocolate!! I used Ina Garten’s black and white angel cake recipe and converted the measurements from cups to grams, hence some of the strange gram measurements. I wasn’t going to take any chances by rounding up the amounts! When following a technical challenge, sticking to a recipe is my number one tip. 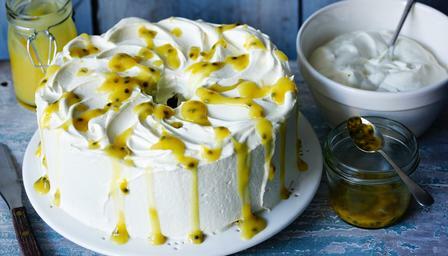 Also, you will need A LOT of bowls for making this cake. I used eight! I felt like I was on a constant hunt for more bowls…. I started by sifting together 100g caster sugar and 171g plain flour, I sifted it 4 times to get plenty of air in it. Once the egg whites formed stiff peaks, I added 1 tsp vanilla and mixed in. I tipped the egg whites into a large bowl and gently folded in the flour and sugar mixture. I followed Ina’s tip for folding. Cut the mixture down the middle with a spatula and pull it round the edge of the bowl, keep doing this and turn the bowl as you fold. I found this to be an excellent method and the amount of air lost was minimal. Finally I folded in 65g coarsely grated dark chocolate – do this at the start as it takes a while, also there will be bits of chocolate all over your kitchen it you’re not careful! I tipped it into a greased and floured bundt pan – wait you say, greased?! Yes, after a read of Stephanie at Riverside Baking’s attempt at Angel Food Cake, I learnt that if you use a non stick tin (like my bundt pan) then you need to grease and flour it so the cake can rise. An angel food cake tin is not non stick, so if you were using one of those, you wouldn’t grease it. I baked on 180C/350F/Gas Mark 4 for 35 – 40 minutes. Then left to cool upside down on a cooling rack. Once fully cool I tipped it out and although it did stick a bit to the tin, I was really pleased with the rise I had gotten and the overall appearance! I made the chocolate glaze by melting together 226g dark chocolate and 175g double cream. The glaze wasn’t as runny as I expected, but I spooned it over the cake, and then added some bronze sprinkles. It looked like a giant donut! I used a serrated knife to cut the cake, as apparently this is necessary because of the different structure of the cake. It was amazingly light and fluffy! The chocolate glaze was delicious and I loved how light the sponge was – made me feel like I could eat lots of it! 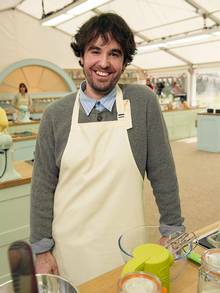 What did you think of The Great British Bake Off’s first episode? How delicious – and I've learned to grease and flour when not using a proper angel food tin! Great summary of week one Kat! Check out my GBBO thought of the week later today! I agree, a topping balances it out perfectly 🙂 Let me know if you make this chocolate one!